Charlotte Perriand is a French architect and designer born the October 24th, 1903 in Paris and died on 27th October 1999. After studying at the Central Union School of Decorative Arts, Charlotte Perriand belongs to the pioneering research Corbusier Pierre Jeanneret for the equipment of the house. Her work affect both urban planning to architecture and interior equipment of the apartments. After World War II, his reflection on modern architecture takes a human dimension and begins to be influenced by her pro-communist commitment. Woman free and passionate, Charlotte Perriand also marked the history of design by his personality, his travels and his special relationship with nature. Strongly influenced by the Japanese and Brazilian cultures, she goes to work wood, straw, bamboo, who become his favorite materials. Today, Charlotte Perriand is considered one of the most famous furniture designers of the 50's. Charlotte Perriand (1903-1999), sideboard, France, circa 1958. Cité Cansado, Mauritania. Published by Steph Simon, France. Modèle Charlotte Perriand / Brevet SGDG. Measures: Height 70 cm, depth 45 cm, width 158 cm. Charlotte Perriand, set of one bench and pair of chairs, wood and rattan, circa 1970, France. 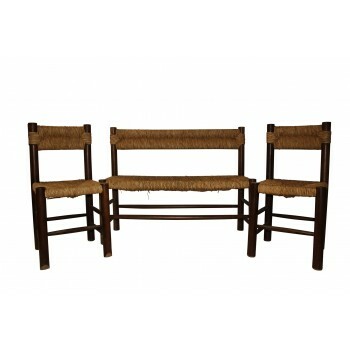 Bench: Height 86 cm, seat height 46cm, width 108 cm, depth 41 cm.Chairs: Height 86 cm, seat height: 46 cm, width 42 cm, depth 41 cm. 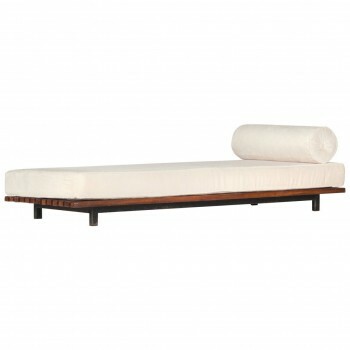 Charlotte Perriand, bench, "Cansado", Metal and wood, Circa 1950, France, Steph Simon Edition, City Cansado, Mauritania, Africa. Measures: Height: 25 cm, length: 260 cm, width: 70 cm. 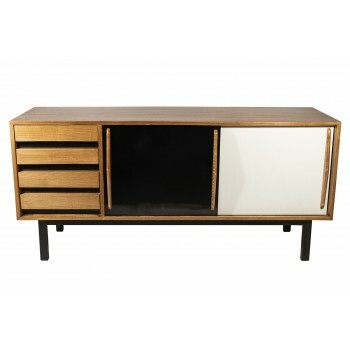 Charlotte Perriand Sideboard from Cité Cansado, circa 1958. Charlotte Perriand (1903-1999). 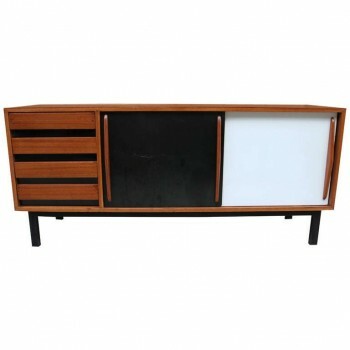 Sideboard, from Cité Cansado, Cansado, Mauritania, circa 1958. Mahogany veneered wood, plastic-laminated plywood, painted metal. Produced by Métal Meuble and Editioned by Steph Simon, France. Provenance: Cité Cansado, Cansado, Mauritania. Restoration of use. Measure: Height: 71 cm, length: 1m58, depth: 45cm. CHARLOTTE PERRIAND (1903-1999), Sideboard, from Cité Cansado,Cansado, Mauritania, circa 1960.Mahogany-veneered wood, plastic-laminated plywood, painted metal.Steph Simon Edition, France.Provenance: Cité Cansado, Cansado, Mauritania.Height: 71 cm, length: 1m58, depth: 45cm. Charlotte Perriand (1903-1999), Sideboard, France, circa 1958, City Cansado Mauritania, Edited by Steph Simon, France. Modèle Charlotte Perriand/Patent SGDG from Cité Pétrolière Cansado, Mauritanie, Afrique. Ash veneer, black and white Formica sliding doors, four drawers. Height: 76 cm, depth 45 cm, length: 157 cm. CHARLOTTE PERRIAND (1930-1999), Console, circa 1958. 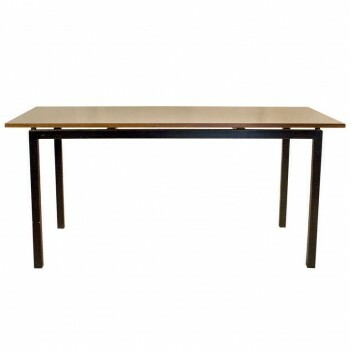 CHARLOTTE PERRIAND (1930-1999), Console, circa 1958.Metal and laminated wood top,Steph Simon Edition, circa 1958, France.Cansado city, Mauritania, Africa.Wear consistent with age and use, Very good vintage condition.Height: 74 cm, length: 1m40, width: 50 cm.